ST. GEORGE — A man who’s ridden his scooter more than 5,000 miles from one end of St. George to another without incident was struck by a driver on Bluff Street Friday night. 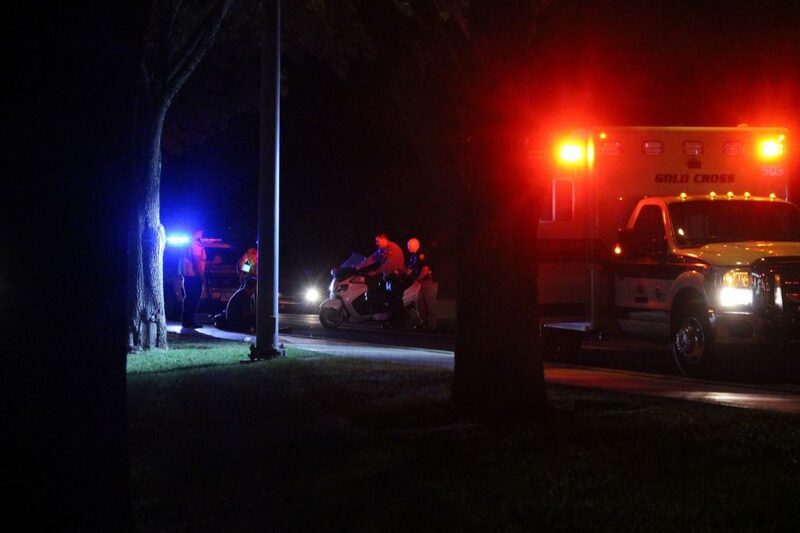 At approximately 9:30 p.m., officers and emergency personnel were dispatched to a crash on Bluff Street near the intersection of St. George Boulevard involving a white Suzuki Burgman 650 scooter and a tan Chevrolet Malibu, St. George Police Officer Joe Deim said. Upon arrival officers found the rider, David Devictoria, sitting on the sidewalk and the driver of the Malibu attempting to move the scooter from the roadway. Herb Basso, who witnessed the crash from the parking lot of Smith’s Food and Drug, said he had a clear view since the collision occurred less than 20 feet from where they were standing. Several people at a nearby shaved ice stand looked up well before the crash occurred, Basso said, because of the length of time the screeching sound continued as the driver attempted to stop before striking the rider who was stopped behind several other vehicles at a traffic light. “That was a long screech for a red light, and that rider was stopped behind several other cars” Basso said. 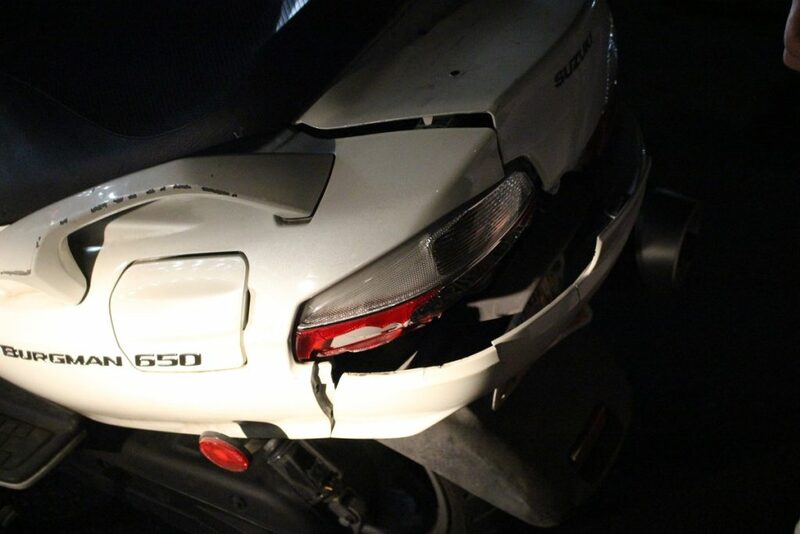 Immediately after the crash, the driver appeared helpful and checked on the rider, Basso said, before attempting to move the scooter out of the roadway. DeVictoria said he braced himself with his knee upon impact, which prevented him from being thrown off the scooter backwards. “If I wouldn’t have used my knee to keep from coming off the bike I would have ended up on the hood of his car,” he said. The driver was given a field sobriety test in the parking lot and later arrested and booked into the Washington County Purgatory Correctional Facility for suspicion of DUI, Deim said. DeVictoria was checked by EMS for abrasions and minor injuries sustained during the crash, Diem said, but he declined transport to the hospital. The Chevrolet driver’s vehicle was impounded after the arrest. This report is based on preliminary information provided by law enforcement and witnesses and may not contain the full scope of findings. Persons arrested or charged are presumed innocent until found guilty in a court of law or as otherwise decided by a trier-of-fact. 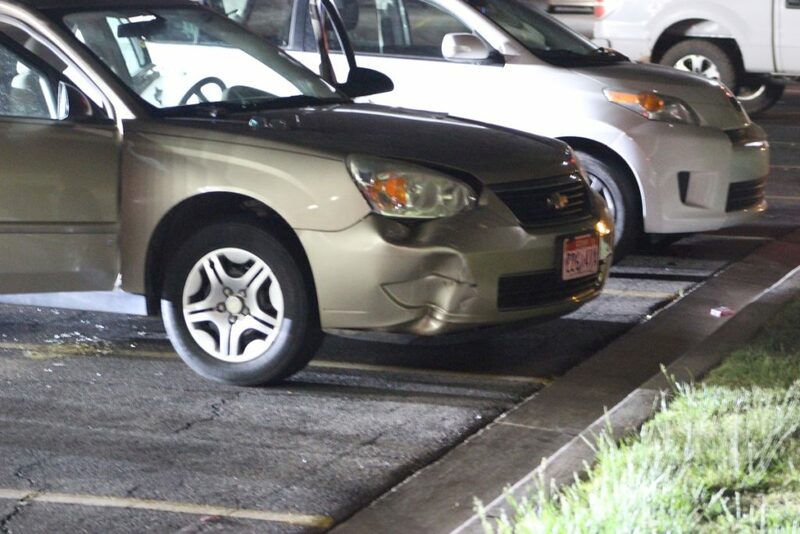 Tan Chevy Malibu struck a scooter and left the rider with minor injuries on Bluff Street Friday night, St. George, Utah, May 5, 2017 | Photo by Cody Blowers, St.
Suzuki Burgman 650 scooter was damaged after it was struck by a Chevy Malibu on Bluff Street Friday night, St. George, Utah, May 5, 2017 | Photo by Cody Blowers, St.